PVC wood plastic crust foam board extrusion production line | Silver Python Machinery Co., Ltd.
PVC wood-plastic crust foam board extrusion production line from the conical twin-screw, stereotypes, traction machine, horizontal cutting machine, stacking platform composition. The production line using the unit using a specially designed conical twin-screw extruder with plastic uniformity, shear rate is small, high yield and long service life and so on. Import temperature control instrument temperature control precision, easy operation and other advantages, but also equipped with large-scale forced cooling device to ensure that the plate surface shape effect. Traction machine adopts imported reducer motor and inverter, with reasonable structure, traction, traction stability and so on. Cutting machine with reliable and accurate work, the advantages of high precision cutting, stacking rack with motor screw control products stacked, easy to use, etc., the unit uses programmable computer control system, the whole control is reliable and stable. 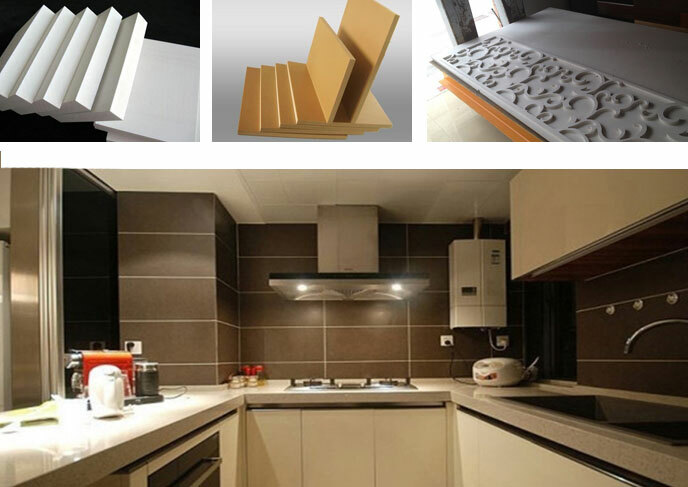 PVC wood-plastic crust foam board extrusion production line principle is through the high temperature and high pressure spiral extrusion, the PVC powder plastic and light calcium carbonate after the plasticizer and mold molding, and then after the cooling down the mold cooling, the final formation The internal covered with foam, the surface smooth as the mirror of the PVC crust foam sheet, the application prospect is very broad. Building furniture industry: building templates, furniture cabinets board, bath cabinet board, home improvement board, floor and so on. Construction and decoration industry: interior decoration board, residential, office, public places building compartment, commercial decoration and so on. Commercial advertising: display printing, computer lettering, advertising signs, signs with the board, advertising display panels, and so on. Industrial applications: chemical industry anti-corrosion engineering, cold storage board, special cold storage, environmental protection board.